French Naval officer and explorer whose expedition vanished in Oceania (1741–c. 1788). 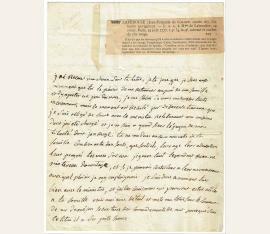 Autograph letter signed („Laperouse“). Paris. 4to. 1 1/2 pp. Mit eigenh. Adresse auf Respektblatt. Rotes Siegel. Einschnitt am oberen Rand vertikal verlaufend (etwa 4 cm). Letter to his sister Mme. Labessiere. 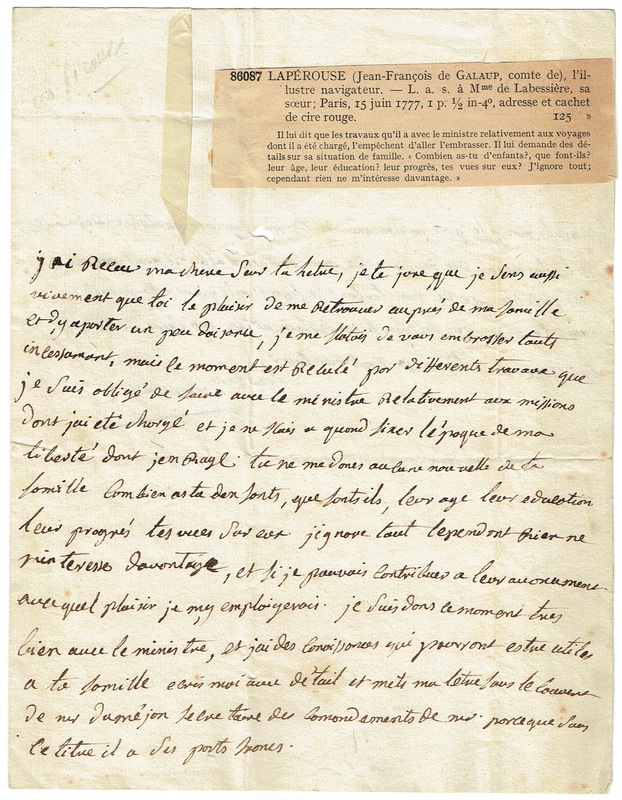 In part (translated): “I have received your letter my dear sister, I swear that I feel as acutely as you the pleasure to be reunited with my family and to ease them a little, I felt sure to embrace you all without delay, but the time is pushed back for different works that I am obligated to do with the minister regarding missions I was put in charge of and I do not know the moment when I will be free which infuriates me. You do not give me news of your family. How many children do you have, what are they doing, their age, their education, their progress your views on them. I know nothing however nothing interests me more, and if I could contribute to their progress it would be a pleasure to do so. I am at this time in good terms with the minister, and I have acquaintances who could be useful to your family. Write me with details […] Please remember me to your husband who has maybe already forgotten me. I will inform you about the time of my arrival in Albi. It could even be very possible that from Montauban I could set out […] but it is not quite certain yet. Adieu my dear friend, I embrace you and I love you with all my heart”. - Occupied by naval expeditions in the Indies, Laperouse had been away from his home in Albi for five years at the time he wrote this letter. Unfortunately, he received a lukewarm welcome as his parents vocally disapproved of the woman he hoped to marry. Not wanting to betray his family, Laperouse put off the marriage and returned to the sea, commanding ships against the British during the American Revolution. After finding great success there—he captured two British forts on the coast of Hudson Bay - he returned home a war hero. His family finally consented to his marriage, and in 1785 King Louis XVI appointed Laperouse to lead a scientific exploration around the world - a voyage from which he did not return. - Addressed on the reverse of the second integral page in his own hand. In very good to fine condition, with a vertical slit to the top affecting nothing, and seal-related paper loss to the integral address leaf..